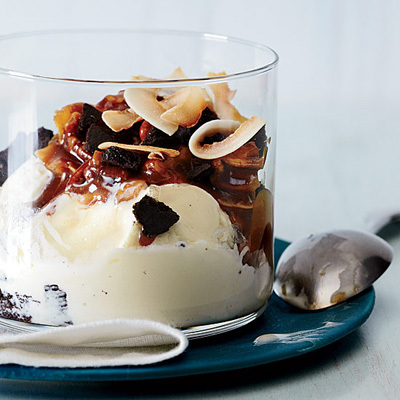 Transform a traditional recipe for German chocolate cake into an elegant and incredibly delicious ice cream sundae. 1. Preheat the oven to 350 degrees F. Spread the coconut and pecans in 2 separate pie plates. Toast the coconut for 5 minutes and the pecans for 10 minutes, until the edges of the coconut start to brown and the pecans are fragrant. Let the coconut and pecans cool, then coarsely chop the pecans. 2. Meanwhile, in a large saucepan, combine the granulated sugar with the light corn syrup and 2 tablespoons of water and bring to a boil, stirring to dissolve the sugar. Wash down the side of the pan with a wet pastry brush. Cook the syrup over moderately high heat without stirring until a deep amber caramel forms, about 5 minutes. Remove from the heat and carefully add the cream. When the bubbles subside, stir to combine. Add the vanilla and salt and let cool slightly. Stir in the toasted pecans and all but 1/4 cup of the toasted coconut chips. 3. Scoop the ice cream into 6 glasses and sprinkle with half of the cookie crumbs. Top with the warm caramel sauce and the remaining cookie crumbs and coconut. Serve right away.